If you are serious about grilling and would consider yourself a grill master, then no doubt you have heard of Weber. Weber produce some of the best quality grills out there. More specifically the Summit S 470 is one of Webers higher end grills that not only could be used for home use but even for parties or commercially thanks to its plentiful cooking space. Let me get into my full review below. Let me first start of by talking about the set up of this grill. While you may be concerned that the set up for such a grill may be difficult you would be wrong. While this isn’t the easiest grill I have set up it definitely isn’t the hardest. It took me about 30 minutes to get things up and running – the instructions are well laid out and even if you aren’t a practical person yourself you should be able to manage with this. Once you get everything set up you will finally get to see the grill in all its glory. It looks absolutely incredible especially in the sun. 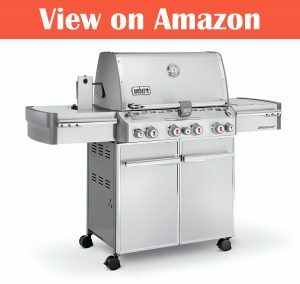 Not only does it look great, but the build quality and overall design of this grill is excellent, everything is well constructed and feels very durable. You are likely interested in this grill not only because of its quality but because of the amount of cooking space it provides. You can cook about 20 average quarter pounders on this thing at the same time! Also, the heat is very well distrusted and even – there are no hot or cold spots anywhere on the cooking grates. As far as the actual cooking goes with this grill – it heats well and the grilling effect gives a great taste and smell along with some amazing sear marks. Each of the burners can be adjusted individually so if you wanted to cook something on a lower heat on what part of the grill you can adjust the according burners which is good. The built in cookbox allows for an oven like cooking effect or can even be used to simply keep food warm in between serving or whatever else you need it for. There is a temperature gauge built into the cookbox so when cooking with it closed you can adjust the burners to get to the desired temperature. As you can see in the picture the grill is has 2 side shelves which can be used for food preparation or whatever else you need them for. In fact, on the right-hand shelf there is a hidden side burner which can be used for traditional stove like cooking which is handy for making sauces or whatever you like. As far as cleaning this grill goes the cooking grates can be removed and are quite easy to clean with a scrubber and some soap. Also, the grease trap under the grates can be easily removed for cleaning and it too is easy to empty and clean after usage. While you could clean them after every single use I personally didn’t think it was necessary thanks to the non-stick cooking grates. 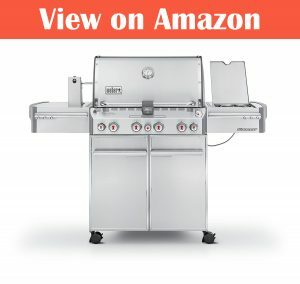 Overall this grill is excellent, it has all the elements that a grill needs, and everything runs perfectly well and the build quality and craftmanship is top notch. Of course this grill is pricey but there is no doubt that you get what you pay for here!